Carver Financial Services, Mentor’s nationally recognized financial services organization, is once again teaming up with Northcoast Shredding Services to help you get rid of those vulnerable, sensitive, confidential documents — the cancelled checks, health information, credit card statements and other records that are so attractive to the wrong people. On Saturday, April 19, from 9 a.m. to 1 p.m., Mentor Public Library invites Mentor residents and library patrons to bring documents to be shredded to the Main Library’s auxiliary parking lot at the corner of Mentor Avenue and Sharonlee Drive (map). Did you miss the Mentor Public Library’s April 14 Community Paper Shred Day? Not to worry: Carver Financial Services of Mentor has teamed up with Northcoast Shredding Services to help you get rid of those vulnerable, sensitive, confidential documents — the cancelled checks, health information, credit card statements and other records that are so attractive to the wrong people. Northcoast Shredding Serviceswill have a mobile shredding unit on-site. 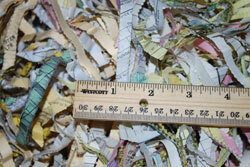 Once they have shredded your documents, the shreds will be sent to a paper mill and properly recycled. The shredding service is free, but Carver Financial Services will be accepting donations of non-perishable food items for the Lake County Salvation Army. For more information, see the Carver Financial Services website.